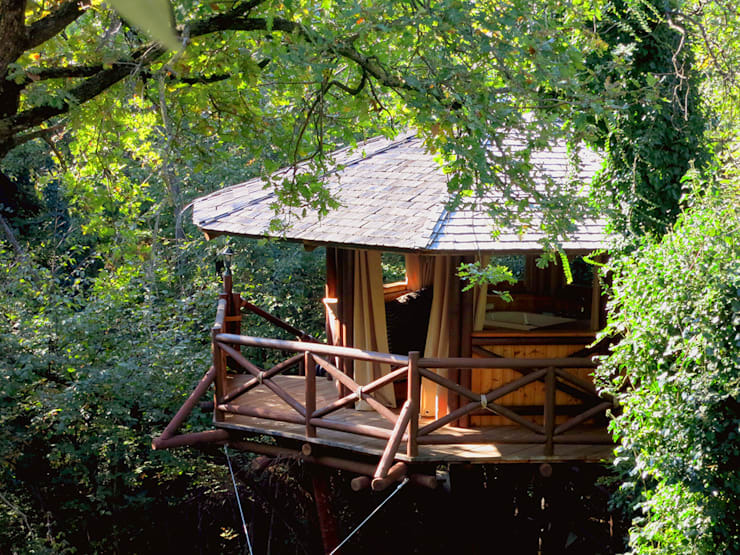 This Italian treetop hideaway isn’t the kind of place where one could throw a huge party… or even have a few guests round for dinner. No, it’s small – very small – but perfectly formed, and it comes equipped with everything two people could need to escape the stresses of the modern world. But only two. At a push. To be honest, any more than one and it would be a bit cosy; but that doesn’t matter, because the point of this house, obviously, is isolation. If its remote position, high above the ground, isn’t enough to deter unwanted visitors from disturbing your peace, then the impossibility of actually fitting them in the building should be. 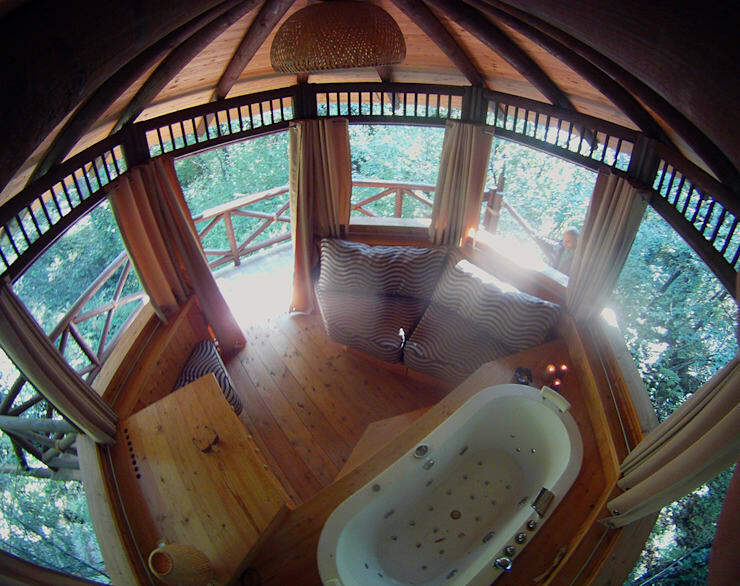 We all have moments, however brief, where we might feel sudden sympathy for Jean Paul Sartre’s belief that “Hell is other people”; at those times, a tree house is all you need to get you through. Try this one. Located in the forest, shielded by trees and positioned far too high up for passersby to get a sneaky look at its occupants, this little house is ideal for those who place a high premium on their privacy. The chunky wood and simple structures of which the building is composed give it the look of something from a bygone age, or from a present somehow unaffected by technological developments. Tiled roof aside, it’s easy to imagine that this building could be located deep in the jungle, and have tribal origins. Viewing this impressive structure from below may be even better. From here we can see the collection of stilts that elevate the building, as well as the rudimentary staircase that further enhances its natural, uncontrived quality. By contrast, the underside of the roof and the exterior walls of the building seem quite artfully constructed, with beams in contrasting wood creating strong, straight geometric patterns. From the outside it doesn’t seem that this building would really be big enough to house a lot of furniture, never mind a lot of people, and the interior reveals this to be true. Where the building’s exterior featured many haphazard, unrefined elements, however, this compact little room – the only one there is – is all about control and neatness. Again, those beautiful contrasting roof beams provide one of the key design features, radiating out from a central point on the roof. Everything else is as carefully planned and measured as they are, with just enough space left for each piece of furniture. This view reveals the contents of the room in their entirety: a little two-person sofa; one additional (though tiny) chair; a cabinet; and a bath tub, complete with a wide array of buttons and taps, presumably providing water jets for a more bubbly bathing experience. 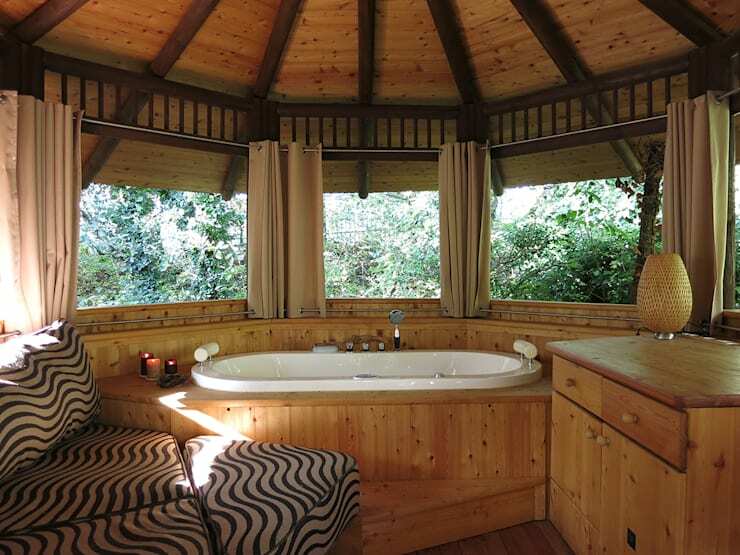 As far as date locations go, it can’t get much better than this (though you might want to wait until you’ve been seeing someone for a while before you start trying to lure them to your treetop bath). There is one glaring question, of course: where is the toilet? Hopefully, there’s one down on the ground… otherwise visitors to this house might be faced with a greater return to basics than they had bargained for. 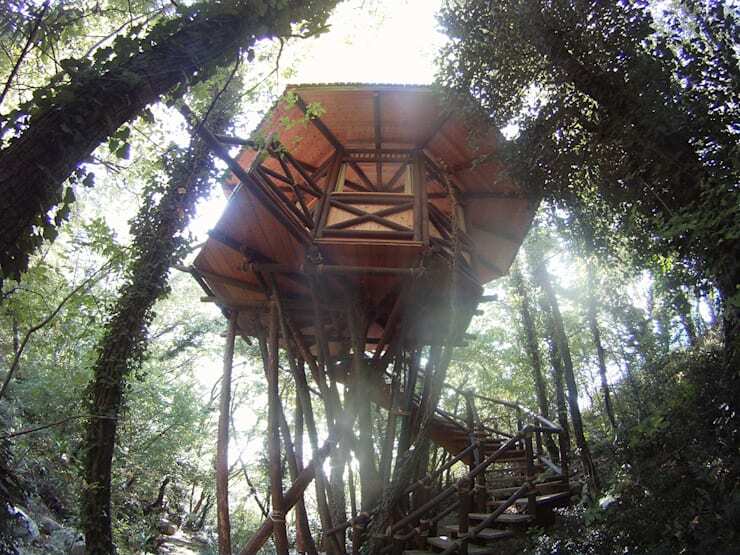 Have you ever wanted a tree house of your own?